A strain of the mixotrophic green Noctiluca scintillans (Noctiluca) isolated from the Arabian Sea afforded us an opportunity to investigate the photosynthetic and feeding characteristics of this organism which has recently replaced the once diatom dominated food chain of winter blooms in the Arabian Sea. Here we present the first in a series of experiments undertaken to study the interactive effects of irradiance and grazing response of this mixotroph to four phytoplankton species provided as food. Noctiluca showed a distinct preference for the dinoflagellate Peridinium foliaceum and the pennate diatom Phaeodactylum tricornutum, but not for the chlorophyte Pyramimonas sp., nor the chain forming diatom Thalassiosira weissflogii. However, irrespective of the food provided, adequate light was required for Noctiluca to grow as evidenced by its maximum growth rates of 1.44 cells day-1 when fed the preferred dinoflagellate Peridinium and exposed to optimal irradiance of 250 μE m-2 s-1 vs. growth rates of 0.18 cells day-1 with the same food but at a low irradiance of 10 μE m-2 s-1. Measurements of Noctiluca’s electron transport rates (ETR) per PSII Reaction Center as a function of irradiance also indicated severe light limitation of photosynthesis at 10 μE m-2 s-1. The active fluorescence derived ETR vs. Irradiance curves also revealed an interesting finding in that there was no significant difference in photosynthetic parameters such as the maximum photosynthetic capacity (ETRmax) nor α, the rate of increase of photosynthesis with light between fed and unfed cells under optimal light conditions. These results suggest that feeding does not enhance the photosynthetic activity of the endosymbionts when nutrients are not limiting as was the case in these experiments. Measurements of Noctiluca’s intracellular ammonium concentrations under optimal light conditions, the first for this strain, show significant accumulation of NH4+ (0.003–0.012 μM NH4+ cell-1) after 14 days for fed and unfed Noctiluca which was undetectable 4 days later. A similar 14-day increase but of significantly higher concentrations (0.005–0.08 μM NH4+ cell-1) was obtained under low light conditions. 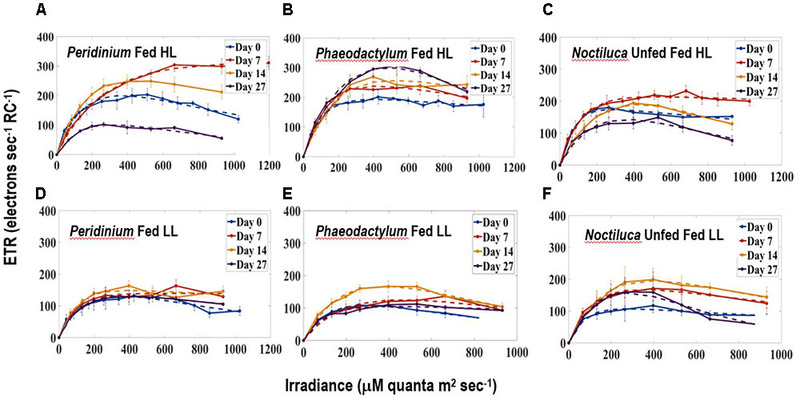 For P. tricornutum and T. weissflogii fed cultures under light limitation, NH4+ continued to increase past the 14-day period suggesting a strong and efficient mechanism for regulation of intracellular nutrients by Noctiluca. Several informative reviews (Stoecker et al., 2009, 2017; Caron, 2016; Mitra et al., 2016; Leles et al., 2017) now urge researchers to recognize that autotrophy (obtaining energy for growth from light) and heterotrophy (utilizing preformed organic matter produced by autotrophs to meet their energy and carbon needs) may often not be mutually exclusive behaviors and many plankton do in fact exhibit some combination of these nutritional modes, an ability generally referred to as mixotrophy (Caron, 2017). Mixotrophy is not confined to just a few unique taxonomic groups but, rather is ubiquitous and occurs amongst different species and in diverse habitats from marine coastal to open ocean systems as well as in freshwater systems (Mitra et al., 2014). Recognizing that the majority of protists are mixotrophs and engaged in varying proportions of phototrophy and phagotrophy, Mitra et al. (2016) and Stoecker et al. (2017) grouped them into one of three general behavioral categories. Firstly, phagotrophic phytoflagellates that possess chloroplasts but also engulf and digest small prey by phagocytosis, secondly, kleptoplastidic protists, heterotrophic species that feed on algae, partially digest them, but retain their chloroplasts in a functional state (Caron, 2017). The third and perhaps least studied of categories are protists or zooplankton with algal endosymbionts of only one species or very closely related algal species (Stoecker et al., 2017). 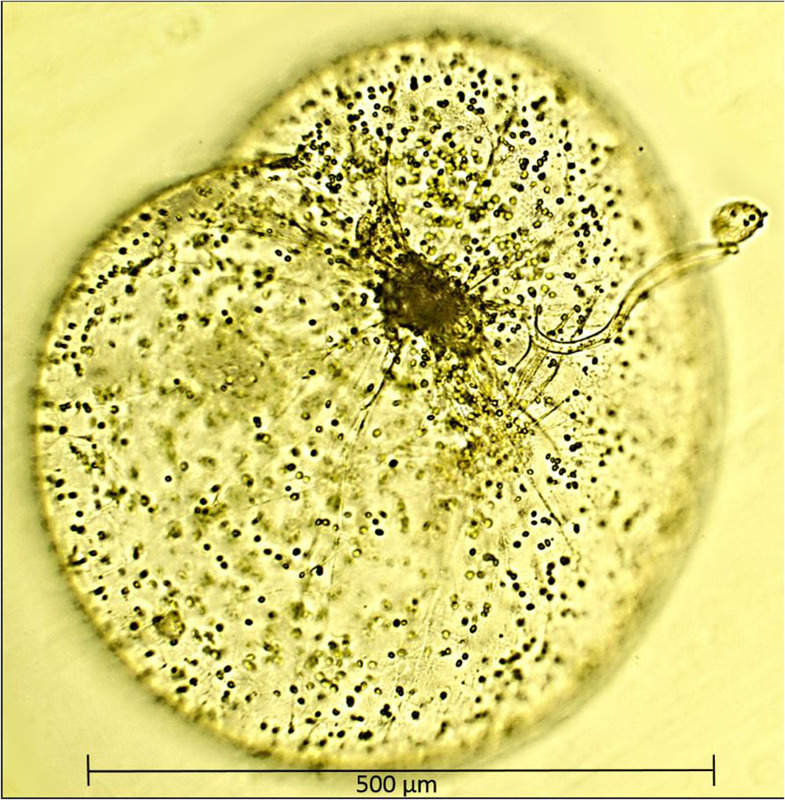 The best example of such mixotrophy is the dinoflagellate Noctiluca scintillans (herein referred to as Noctiluca as there is only one species in the genus Noctiluca) which harbors thousands of free-swimming endosymbiotic green algae. In contrast, to the exclusively heterotrophic red Noctiluca which is globally ubiquitous, green Noctiluca, is much more restricted and limited mainly to tropical southeast Asian waters and parts of the Arabian Sea, Gulf of Oman, and the Red Sea (Harrison et al., 2011). Localized blooms of this green endosymbiont carrying Noctiluca have been recurring in Southeast Asian waters such as in the Manila Bay, the upper Gulf of Thailand, and Jakarta Bay (Furuya et al., 2006a,b), in the coastal waters of Vietnam and Cambodia (Harrison et al., 2011) and further west in the Sea of Oman (also known as the Gulf of Oman) (Al-Azri et al., 2012; Al-Hashmi et al., 2015). In the early 2000s, using microscopy in conjunction with ocean color imagery we reported (Gomes et al., 2008, 2009) for the first time, large scale and recurrent blooms of the green Noctiluca in the northern Arabian Sea. The Noctiluca of the Arabian Sea is large (diameter of ∼600–1000 μm), bulbous and harbors thousands of endosymbionts, which swim freely within its large central vacuole (Figure 1). On the basis of molecular analysis and the priority rule of nomenclature, the ecological characteristics of the endosymbionts within Noctiluca have been reclassified as Protoeuglena noctilucae (Wang et al., 2016) instead of Pedinomonas noctilucae, the earlier species name given in Sweeney (1976). FIGURE 1. A single cell of Noctiluca scintillans with free-swimming endosymbionts Protoeuglena noctilucae using its tentacle to capture algal cells for feeding. Image was produced with a epifluorescence microscope (OMAX 40X–2500X) with a 40× objective. Thick surface blooms of Noctiluca are now becoming more pervasive and widespread throughout the northern and central AS, causing a radical shift in the usually diatom dominant winter monsoonal blooms, one of the two high productivity periods in the otherwise oligotrophic Arabian Sea (Gomes et al., 2008; Goes et al., 2018). In Gomes et al. (2014) we showed that a combination of its ability to feed on extraneous phytoplankton prey and the recent spread of hypoxia in the Arabian Sea were favoring the growth of Noctiluca over that of diatoms. Specifically, we observed that Noctiluca have higher rates of carbon fixation in hypoxic waters as compared to diatoms (Gomes et al., 2014). O2 deficiency (<4 μM) and a permanent oxygen minimum zone (OMZ) at mid-depths (>120 m) is a unique feature of the northeastern Arabian Sea, a consequence of high surface productivity of the semi-annual phytoplankton blooms (Goes et al., 2005), sub-thermocline source waters that have naturally low dissolved O2 content flowing from the Southern Ocean and poor ventilation of subsurface waters in the landlocked north (Morrison et al., 1999). Comparison of O2 saturation data from our recent studies with historic data (Gomes et al., 2014) showed that the Arabian Sea’s euphotic zone was indeed experiencing an influx of hypoxic waters from an expanding OMZ. A recent study by Lachkar et al. (2017) confirmed the findings of Gomes et al. (2014). This phenomenon is not confined only to the Arabian Sea but is being experienced in many regions of the world (Breitburg et al., 2018) because of human activities that have increased global temperatures and nutrients discharged to coastal waters. Coupled with this unique functional and adaptive response of Noctiluca and its endosymbiont to hypoxia, is its voracious predation of diatoms and other phytoplankton that form the winter blooms of the Arabian Sea fueled by new nitrogen inputs from convective mixing (Banse and McClain, 1986). Noctiluca’s requirement for inorganic nutrients for photosynthesis by its endosymbionts, and its ability to graze on other phytoplankton suggests that it competes for resources (nutrients and prey) with both its prey and predators but little is known about how it regulates its photosynthetic and heterotrophic processes. The few studies, reviewed in Harrison et al. (2011) suggest that although Noctiluca can grow photo-autotrophically for several generations, phagotrophy promotes faster growth and is a requirement for bloom formation (Sriwoon et al., 2008). Feeding experiments conducted during a bloom in the Arabian Sea to elucidate the interplay between dependence of Noctiluca on its autotrophic endosymbionts and its facultative phagotrophy (Gomes et al., 2014) showed that growth rates of Noctiluca were much lower in the dark even with addition of food as compared to rates for cells grown in the light indicating the importance of autotrophic endosymbionts for growth. Even more interesting was the fact that growth rates in samples where light and nutrients were provided were comparable to those where light and food (but not nutrients) were provided. Growth rates did not increase when nutrients were added to flasks containing food and exposed to light, suggesting that when food is available, Noctiluca is capable of meeting a large fraction of its metabolic requirements via phagotrophy. What was lacking in this study was knowledge of whether Noctiluca had food preferences although the general consensus based on experimental evidence with red Noctiluca is that it is not particularly selective (Elbrachter and Qi, 1998; Zhang et al., 2016). On account of the paucity of information on this unique and novel organism, little is known on the regulation and interplay between photosynthetic and heterotrophic processes, key information required to understand its recent proliferation in tropical waters (Furuya et al., 2006a,b; Harrison et al., 2011; Al-Azri et al., 2012; Al-Hashmi et al., 2015). An isolate from the Arabian Sea afforded us with an opportunity to conduct controlled, laboratory experiments. This culture is more akin to that of Furuya et al. (2006b) and Saito et al. (2006) from the Manila Bay because it grows in a 12 h light-dark cycle, without food for more than a year and even without the addition of fresh media. It differs from the one described by Sweeney (1971) and Hansen et al. (2004) which could survive and divide in the light with or without addition of food for only about a month. In this series of experiments described in detail below, we fed the laboratory grown strain of Noctiluca with four phytoplankton species viz. Two diatoms, Phaeodactylum tricornutum and Thalassiosira weissflogii, a dinoflagellate Peridinium foliaceum and a green alga Pyramimonas sp. In addition to counting Noctiluca cells to ascertain growth with the different foods provided, we also assessed the photosynthetic efficiency of the green endosymbionts using photosynthesis-irradiance responses (Platt and Jassby, 1976). Additionally, we conducted preliminary measurements on the NH4+ content of Noctiluca cells. This aspect of Noctiluca has rarely been addressed although it is known that the heterotrophic red variety of Noctiluca accumulates large quantities of NH4+ (Okaichi and Nishio, 1976) which makes it buoyant (Furuya et al., 2006a). This is also the case with Noctiluca blooms in the Arabian Sea which form green carpets over large expanses of the sea even though this exposes them to inhibitory light levels (Goes and Gomes, 2016). Noctiluca cells isolated from the open waters of the Arabian Sea are maintained in f/20 medium without silicate (f/20 – Si) in polycarbonate bottles at 26°C and exposed to a light intensity of approximately 200 μE m-2 s-1 and a photoperiod of 11.5 h light: 12.5 h dark. This culture is maintained without extraneous food. The four prey cultures used in the feeding experiments were isolated from warm tropical waters and include a pennate diatom (P. tricornutum; CCMP632, cell dimensions of 18–26 μm), a centric diatom (T. weissflogii; CCMP1336, cell dimensions of 12–22 μm), and one chlorophyte (Pyramimonas c.f. sp. ; CCMP1239, cell dimensions of 5–10 μm) all obtained from the NCMA, Bigelow Laboratory for Ocean Sciences, ME, United States). A fourth, the dinoflagellate P. foliaceum (cell dimensions of 5–10 μm) was obtained from Dr. E. J. Buskey, University of Texas, TX, United States. P. tricornutum and T. weissflogii are grown in f/2 medium; while Pyramimonas and P. foliaceum are grown in f/2 – Si. All prey cultures are maintained at 26°C with a light intensity of approximately 200 μE m-2 s-1 and a photoperiod of 11 h Light: 13 h Dark. Growth media for the prey cultures was prepared in 0.22 μm membrane filtered seawater (FSW) according to protocols provided by NCMA. Growth and grazing experiments were started once all cultures had reached exponential phase. All polycarbonate bottles in which the experiments were conducted were acid-washed and soaked overnight with 5% technical grade HCl, rinsed with Milli-Q distilled water, and autoclaved prior to use. A schematic of the experimental setup is shown in Supplementary Figure S1. Twenty cleaned 250 mL polycarbonate bottles were filled with 200 mL of sterile f/20 – Si medium and 50 Noctiluca cells were added to each of them. Cells were picked individually using plastic transfer pipettes, and washed in sterile FSW before being introduced into the bottles. Ten of these bottles containing Noctiluca were placed in light replete (HL, 250 μE m-2 s-1) conditions and 10 in light limited (LL, 10 μE m-2 s-1) conditions in an incubator at 26°C. LL conditions were simulated by covering the cool white light fluorescent tubes of the lower tiers of the incubator with neutral density filters. Aliquots of each of the four prey suspensions were added to eight bottles reserved for the HL treatment so that each prey treatment had two duplicate bottles. The volume of prey approximated 1–2 μg L-1 Chlorophyll a (Chl a, a proxy for biomass) per bottle (volume of culture was 3.29 mL for Pyramimonas sp. and <1 mL for the other three prey cultures). No food was added to the remaining two Noctiluca bottles which served as controls. The setup for the 10 LL bottles was identical to the one described for the 10 HL bottles. Four additional bottles with only prey cultures were placed in the HL section of the incubator. Based on preliminary work, Noctiluca was allowed to adapt to the four prey cultures for 7 days. All bottles were maintained at 26°C with a photoperiod of 11.5 h light: 12.5 h dark for 27 days on three dimensional gyratory rockers to gently agitate the cells and encourage natural interaction between predator and prey. Details of the sampling protocols and of all measurements conducted are presented below. Chl a, was measured fluorometrically (Holm-Hansen and Riemann, 1978) using a Turner® Designs Trilogy Laboratory Fluorometer to determine the initial biomass of the four stock prey cultures prior to being fed to Noctiluca. Chl a was extracted in acetone in cells filtered through 0.7 μm Whatman® GF/F glass filters. The same procedure was employed to measure Chl a during the course of the experiment. Cell counts of prey prior to being fed and during the course of the experiment were undertaken using FlowCAM®, an imaging particle analyzer that combines imaging and laser light to detect particles and capture their images which are then identified from pre-built libraries (Poulton, 2016). Prey counts were made by drawing 4.9 mL of culture in duplicate from each of the bottles, which was preserved with 0.1 mL neutral Lugol’s iodine solution. Care was taken to draw this sub-sample from the bottom, and if any Noctiluca cells were observed in the transfer pipette the process was repeated until we are assured that the sub-sample had no Noctiluca cells. To obtain Noctiluca counts, 5 ml of media from each bottle was drawn into a sterile plastic transfer pipette and the number of individual cells in the pipette was counted before the volume was returned to the bottle. This process was repeated five times to ascertain accuracy. Noctiluca’s large size allowed us to count cells using this non-invasive method. A suite of photosynthetic and physiological characteristics of Noctiluca’s endosymbionts was assessed using the Fluorescence Inductance and relaxation technique in a mini-FIRe benchtop instrument (Gorbunov and Falkowski, 2004; Park et al., 2013). Variable Fluorescence, a unique property of the photosynthetic machinery (Gorbunov and Falkowski, 2004) is related to the efficiency of photosynthetic processes and provides us with estimates of the physiological status of photosynthetic organisms (Kolber et al., 1998). Variable Fluorescence (FV) is calculated using initial (F0) and maximum (FM) fluorescence after illumination with a high-energy flash (FV = FM - F0). Quantum efficiency of the photochemistry in Photosystem II (PSII), a relative measure of the electron transport efficiency is the ratio of the Variable Florescence Fv and the maximum Fluorescence Fm, i.e., FV/FM. High FV/FM is associated with a functioning PSII and, therefore, is a proximal measurement of cellular integrity and metabolic capability while fluctuations may indicate “stressful growth” such as nutrient starvation or excessive light (Suggett et al., 2009). Variable Fluorescence can then be used to calculate parameters that characterize photosynthetic light-harvesting processes, the photochemistry in PSII, and the photosynthetic electron transport down to carbon fixation. In addition to the quantum efficiency of PSII (FV/FM) our FIRe system also provides the cross section of PSII (σPSII), which is a measure of the size of the light-harvesting antenna system associated with PSII (Bibby et al., 2008). Using these parameters we can then calculate the photosynthetic ETR per PSII Reaction Center (RC) as described in Park et al. (2013) which is related to the rate of primary production or carbon fixation (Gorbunov and Falkowski, 2004). Using FIRe, ETR measurements were performed over a range of light levels using an Actinic Light Source to obtain ETR rates as a function of irradiance. These ETR-Irradiance curves (ETR-E) are similar to the Photosynthesis-Irradiance curves (P-E) (Platt and Sathyendranath, 1988) that have been used widely to measure primary productivity at basin or global scales (Platt et al., 1980; Bouman et al., 2005) and serve to understand the acclimation state of the phytoplankton and as indicators of the influences of environmental factors such as light and nutrients on primary production (Falkowski et al., 1981; Henley, 1993). These ETR-E curves like the Photosynthesis-Irradiance curves provide parameters such as maximum ETR (ETRmax), α, the initial light-limited slope and saturation irradiance Ek (Platt et al., 1980; Park et al., 2013; Houliez et al., 2017). Depending on the presence or absence of photoinhibition two different models of (Platt et al., 1980) were fitted to the ETR data. All curve fitting was done using MATLAB 2016b routines. In order to conduct the above measurements, 10 Noctiluca cells from each bottle were carefully picked with transfer pipettes, cleaned in sterile FSW to prevent the carryover of prey and suspended into glass tubes containing sterile FSW. The glass cuvette was inserted into the compartment and the actinic light source (ALS) was placed on top of the holder. The length of the multi-turnover flash (MTF) was set to 100 ms, the number of pulses in the relaxation sequence (MTRP) was set to 40, while the maximum PAR for the ALS was set to 1200 μmole/m2/s. The number of PAR steps was set to 10, and the time delay in which the ALS was on prior to data acquisition was set to 5 s. To acquire the parameters described above the data was further processed with a program supplied with the instrument. Known aliquots of f/20 – Si medium were added to the sample bottles to account for any loss in volume occurring after sampling. After the FIRe measurements, the same samples containing the 10 Noctiluca cells were used to measure Chl a of the endosymbionts using the fluorometric method described above. FIRe measurements were also conducted with prey samples without Noctiluca to estimate the photophysiological status of the prey. We could not conduct weekly FIRe or Chl a estimates of the prey in the bottles because we have observed in our routine maintenance of Noctiluca that it ejects out its endosymbionts. So we instead relied on FlowCAM® derived cell counts of prey samples which were more accurate. NH4+ accumulation in Noctiluca cells was measured at the start of the experiment, and after 14 and 18 days. This was done by placing five washed and cleaned cells into 15 mL plastic centrifuge tubes containing 10 mL Milli-Q distilled water. The process was repeated with five more cells to obtain replicates. Samples were collected in duplicate, vortexed, and frozen at -80°C prior to analysis. Ammonium was measured colorimetrically with the Turner Designs Trilogy laboratory fluorometer according to Holmes et al. (1999). where Nt0 = concentration of cells at time 0 (cells ml-1), Nt1 = concentration of cells at time 1 (cells ml-1), and t = duration of each experiment (d). All statistical tests used to test the significance of differences in growth of Noctiluca as well as differences in photosynthetic parameters of the ETR-E curves were performed using JMP 9® software. Of the four phytoplankton species provided as food and exposed to HL and LL conditions, the green Noctiluca culture currently growing in our laboratory, showed a distinct preference for the diatom P. tricornutum and the dinoflagellate P. foliaceum (Figure 2A). Conversely, it grew very slowly when fed the small celled Pyramimonas sp. while no growth was observed with the chain forming diatom T. weissflogii. Statistically significant differences (Paired t-test, p < 0.05, Supplementary Table 1) were observed between the number of cells in control samples with only Noctiluca and Noctiluca cells fed either P. foliaceum or P. tricornutum but this was not the case with cells feed either T. weisflogii or Pyramimonas sp. LL exposed Noctiluca cells (Figure 2B) showed similar food preferences after 14 days but growth was much slower and maximum number of cells was about 5233 cells L-1 in Peridinium fed cultures compared to 25,500 cells L-1 in HL with the same food. A comparison of all Noctiluca cells grown with prey in HL vs. LL, showed a statistically significant difference (Paired t-test, p < 0.05, Supplementary Table 1) for all four prey cultures indicating the importance of light for endosymbiont photosynthesis and growth of Noctiluca. Growth rates for the preferred food P. foliaceum increased from 0.25 cells day-1 after 5 days to 1.0 cells day-1, 2 days later (Figure 3). Maximum growth rates of 1.44 cells day-1 were encountered after 14 days (Figure 3). 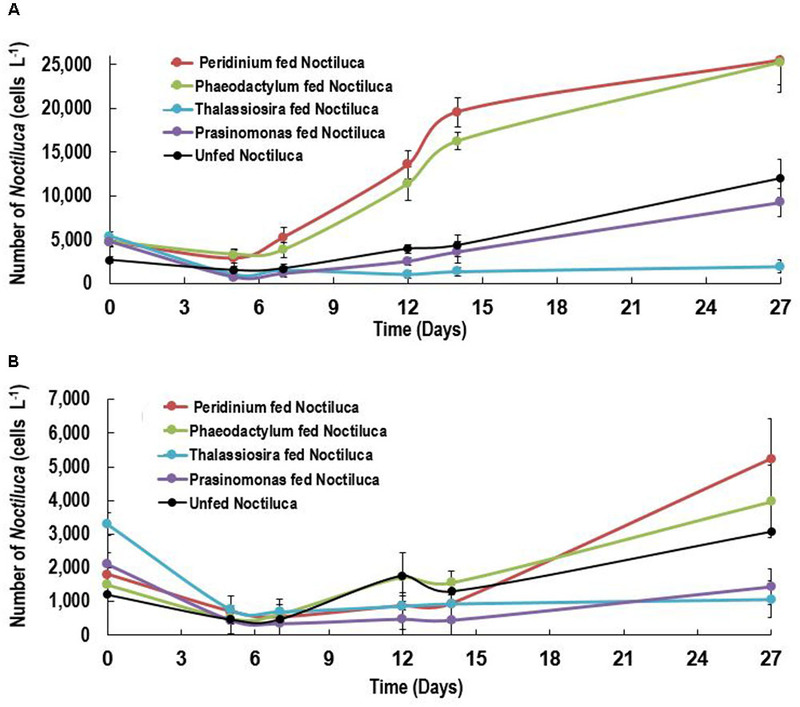 When Noctiluca was fed P. tricornutum, the other preferred food, growth rates although slower initially, increased to attain a maximum value of 1.6 cells day-1 after 14 days. This contrasted with growth rates of 0.56 cells day-1 for unfed Noctiluca for the same time period. Conversely, maximum growth rates for Thalassiosira fed cultures measured only 0.4 cells day-1 after 14 days while that of Pyramimonas sp. fed cultures measured 0.9 cells day-1 for the same time period. Growth rates of Noctiluca without food ranged from 0.12 to 0.5 cells day-1 and were in fact comparable to those of cells fed with Pyramimonas sp. Growth was very slow in the LL regime, regardless of the food provided and ranged from negligible to 0.26 cells day-1 (Figure 3). FIGURE 2. (A,B) Growth response (Cells L-1) of unfed Noctiluca and Noctiluca fed with prey and exposed to (A) optimal light (250 μE m-2 s-1, HL) (B) low light (10 μE m-2 s-1, LL). Data points represent means ± SE (n = 2). FIGURE 3. 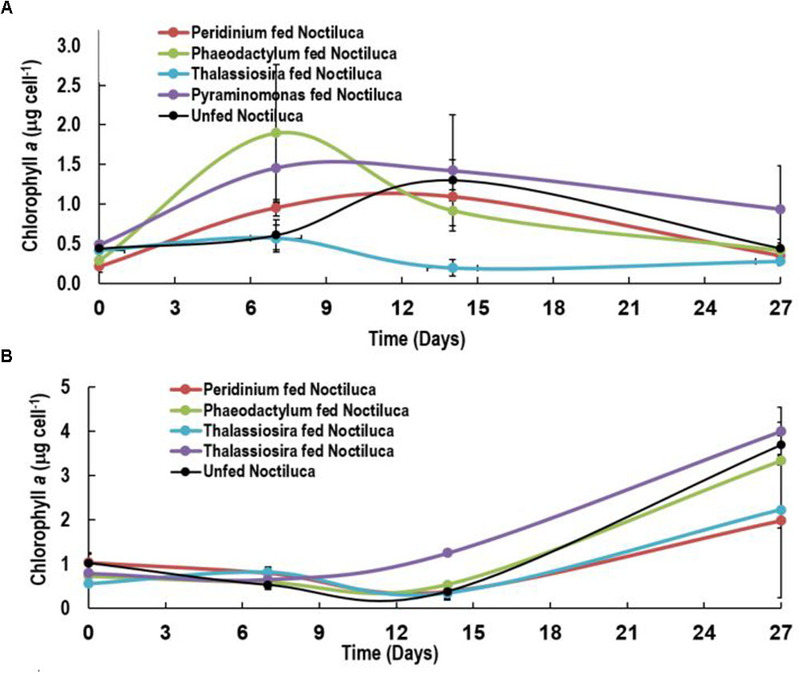 Growth rates (cells day-1) over the course of the experiment for unfed Noctiluca and for Noctiluca fed P. foliaceum (Perid), P. tricornutum (Phaeod), T. weissflogii (Thalas), and Pyramimonas sp. (Pyram) and exposed to optimal (250 μE m-2 s-1, HL) and low light (10 μE m-2 s-1, LL). Data points represent means ± SE (n = 2). 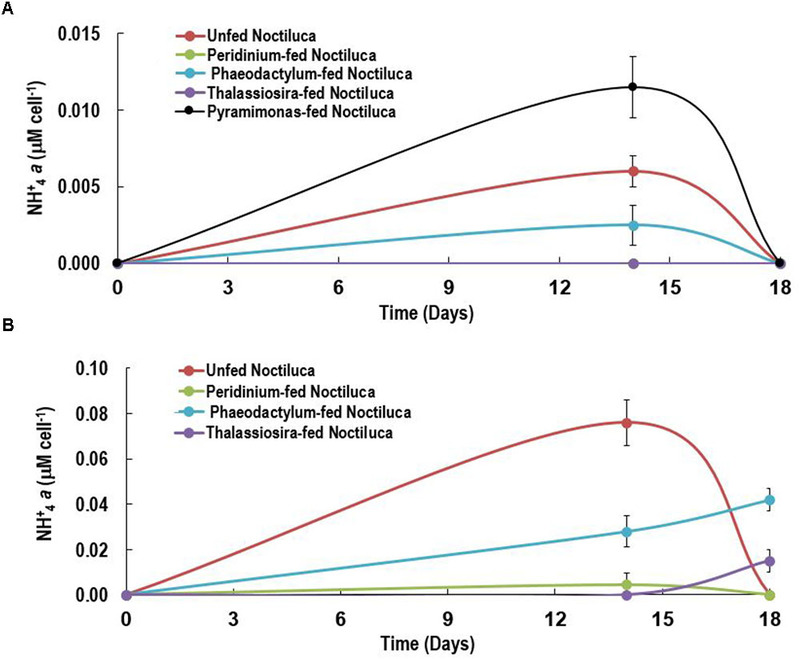 In the case of P. foliaceum and P. tricornutum fed cultures of Noctiluca and exposed to HL, it should be noted that in spite of a decrease in growth rates between 14 and 27 days (Figure 3), the number of Noctiluca cells still increased from about 4000 to 6300 to cells L-1. From day 14 to 21, LL adapted cells, also showed a small increase in growth rates (negligible to 0.2–3 cells day-1) which led to an increase in the number of cells by the end of the experiment. Noctiluca counts in LL with P. foliaceum as food increased from about 950 cells day-1 to 5233 cells day-1 whereas P. tricornutum fed cultures over this same period increased from 1600 cells day-1 to 4000 cells day-1 (Figure 2B). Similarly, unfed Noctiluca in the LL regime also increased from 1300 cells day-1 to 3100 cells day-1 (Figure 2B). These increases towards the end of the experiment could possibly be from acclimatization by endosymbionts to light levels which initially had been severely limiting. A slightly different pattern emerged when Noctiluca’s intracellular Chl a concentrations per cell were estimated (Figures 4A,B). Intracellular concentrations in cells fed with the two preferred foods increased in the first 7 days but gradually decreased to concentrations approximating those at the start of the experiment. Almost invariant intracellular Chl a concentrations were measured in Pyramimonas sp. fed cells over the experimental period. FIGURE 4. Intracellular Chlorophyll a concentrations of Noctiluca (μg Noctiluca cell-1) for unfed Noctiluca and for Noctiluca fed with P. foliaceum, P. tricornutum, T. weissflogii, and Pyraminomonas sp. for (A) optimal (250 μE m-2 s-1, HL) and (B) low light (10 μE m-2 s-1, LL) exposed cultures. Data points represent means ± SE (n = 2). After 14 days, when intracellular Chl a concentrations of HL exposed cells began to decrease subsequent to a peak of 0.6–2.0 μg cell-1, a reverse situation was observed in LL light adapted cells where intracellular Chl a increased almost twofold especially in Noctiluca fed the two preferred foods and fourfold with the other two foods as well as in the unfed Noctiluca (Figures 4A,B). One reason for this is that higher growth, cell division and an increase in cell numbers in the HL grown cells compared to those in LL, resulted in smaller cells in HL exposed cultures which contained less endosymbionts and consequently lower intracellular Chl a. The other, probably relates to pigment packaging invariably observed in phytoplankton cells growing under low light. When exposed for prolonged periods to low light, phytoplankton cells usually increase their pigment concentration and change the organization of pigments within their photosynthetic units to aid in harvesting light (Falkowski and Owens, 1980). However, pigment molecules, when tightly packed instead of being uniformly distributed within the cell, lessen the overall effectiveness in collecting photons from the prevailing irradiance field, lowering their efficiency of light absorption and consequently the amount of carbon fixation (Morel and Bricaud, 1981; Sosik and Mitchell, 1994). We believe that the increase in Chl a in Noctiluca cells growing under LL conditions is akin to pigment packaging in phytoplankton cells. Figures 5A–F compares ETR vs. E curves in HL (Figures 5A–C) and LL (Figures 5D–F) regimes for Noctiluca cells grown with the two preferred foods P. foliaceum and P. tricornutum and unfed Noctiluca. All curves are an average of four replicate measurements. Both the light limited (initial) and light saturated parts of the curves from HL and LL exposed cells responded markedly to changes in irradiances. Maximum ETR (ETRmax) or the maximum photosynthetic capacity was clearly higher in HL exposed cells than in LL cells. Average ETRmax was 236 electrons s-1 RC-1 (electrons s-1 Reaction Center-1) in HL exposed cells as opposed to 154 electrons s-1 RC-1 in LL exposed cells. The differences in ETRmax between HL and LL exposed cells were statistically significant (Paired t-test, p < 0.001; Supplementary Table S1). The rate of increase of light-limited ETR (α), which is the slope of the initial part of the curve and quantifies the efficiency of light capture averaged 2.0 electrons m2 RC-1 μmole quanta-1 compared to 1.5 electrons m2 RC-1 μmole quanta-1 for LL exposed cells. The differences in α, derived from curves of HL and LL exposed cells was also statistically significant (Paired t-test, p < 0.005; Supplementary Table S1). The saturating irradiance for ETR (Ek) which represents the optimal irradiance for photosynthesis was lower (average 380 μmole quanta-1 s-1) in LL exposed cells compared to that of cells exposed to HL (124 390 μmole quanta-1 s-1) although this difference was not statistically significant. FIGURE 5. Electron Transport Rates-Irradiance (ETR-E) curves for (A) P. foliaceum fed Noctiluca cells in HL (B) P. tricornutum fed Noctiluca cells in HL (C) Unfed Noctiluca cells in HL (250 μE m-2 s-1) fitted to the function of Platt et al. (1980), as described in Section “Materials and Methods.” ETR is expressed as electrons s-1 Reaction Center-1. (D–F) are for the same but exposed to LL (10 μE m-2 s-1). Data points represent means ± SE (n = 4). Comparison of the parameters of the ETR vs. E curves obtained from fed and unfed cultures in HL exposed cells, provides us with information on whether food enhances the photosynthetic activity of the endosymbionts. Neither ETRmax, the maximum photosynthetic capacity nor α, the maximum rate of increase of light-limited photosynthesis, from both P. foliaceum and P. tricornutum fed cultures of Noctiluca in HL, were statistically different from those derived from unfed Noctiluca in the same light regime. This indicates that the endosymbionts in both fed and unfed cultures were not under any nutrient stress. Although there are several reports on the accumulation of NH4+ in red Noctiluca (Okaichi and Nishio, 1976; Zhang et al., 2017) no such exist for green Noctiluca. This first report on the per cell intracellular concentrations of NH4+ in green Noctiluca in HL exposed cells (Figure 6A) show that highest NH4+ accumulation occurred on day 14 but decreased to undetectable concentrations 4 days later. This indicates rapid uptake of NH4+ by the green endosymbionts. NH4+ concentrations below detection levels were observed in cells fed the preferred food, P. foliaceum while the second lowest (0.0025 μM NH4+ cell-1) concentration was found in P. tricornutum fed cells. The highest accumulation (0.01 μM NH4+ cell-1) was observed in cells fed the least preferred food, Pyramimonas sp. This can tentatively suggest higher uptake of NH4+ by the green endosymbionts in cells that were fed the favored foods. Highest NH4+ accumulation of 0.006 NH4+ μM cell-1 was measured in unfed samples. In contrast, LL exposed cells intracellular NH4+ concentrations were almost an order higher than those in HL exposed cells (Figure 6B). This is an indication that nutrient uptake by endosymbionts was lower when photosynthesis was light limited. FIGURE 6. Intracellular NH+4 concentrations of Noctiluca (μg Noctiluca cell-1) for unfed Noctiluca and for Noctiluca fed with P. foliaceum, P. tricornutum, T. weissflogii, and Pyramimonas sp. for (A) optimal (HL) and (B) low light (LL) exposed cultures. Data points represent means ± SE (n = 2). The strain of green Noctiluca from the Arabian Sea showed a distinct preference for P. foliaceum and P. tricornutum. Although it also grew without food especially in HL exposed cells, growth rates were almost half of that in the fed cultures and cell counts were five-fold higher in the latter after 14 days of feeding. The only other study on feeding and food preference in green Noctiluca (Hansen et al., 2004) isolated from the Manila Bay, Philippines showed a preference for two dinoflagellates Pyrodinium bahamense and Akashiwo sanguinea. The difference between these two studies is that irrespective of food type, food concentration, and irradiance, the Noctiluca culture in the study of Hansen et al. (2004) lost its endosymbionts after about 3 weeks and became colorless and died. This was not the case with the Arabian Sea Noctiluca culture which continued to grow albeit slowly even after the end of the experiment. Both, the current study and our previous one conducted in the Arabian Sea (Gomes et al., 2014) where natural populations of Noctiluca were fed a mixed phytoplankton bloom predominated by diatoms showed similar results to those obtained by Hansen et al. (2004) in that growth rates were higher for fed cultures than for unfed Noctiluca. A major difference between our results and that of Hansen et al. (2004), was that our growth rates for unfed cultures were much higher (0.1–0.5 cells day-1 for HL and 0.03–0.2 cells day-1 for LL) than those measured by Hansen et al. (2004) which were 0.058 for LL and 0.14 for HL cells day-1 at comparable irradiances. Our study clears shows that irrespective of the quality of food provided, adequate light is required for green Noctiluca to grow which reiterates findings from the earlier two studies (Hansen et al., 2004; Gomes et al., 2014). This is also clearly observed is in the ETR vs. E curves where higher ETRmax or maximum photosynthetic capacity was observed in HL exposed cells. Beyond this maxima, the rate of photosynthesis is limited by the activity of the electron transport chain or Calvin cycle (Serôdio et al., 2005). The non-intrusive technique of ETR vs. E curves which we utilized yielded an interesting result in that the type of food provided did not change the photosynthetic response of the endosymbionts as there was no statistically significant relationship in the ETR vs. E parameters of fed (including the two preferred foods) and unfed Noctiluca cells. In addition to responding to variations in irradiance, both P-E curves and variable fluorescence are sensitive to changes in nutrient and trace metal concentrations (Falkowski and Kolber, 1995; Behrenfeld and Kolber, 1999; Bouman et al., 2005). The similarity in photosynthetic parameters between fed and unfed Noctiluca indicates that endosymbionts did not experience nutrient variations especially nutrient limitation in either of the two treatments. Using two types of cultures, one that required feeding to survive and the other which like our culture survived for extended periods without food, Saito et al. (2006) performed P-E curves where photosynthesis was measured using oxygen concentrations. They too observed no significant differences in gross photosynthetic rate between the feeding and non-feeding rate but net photosynthesis was higher in the non-feeding strain because feeding strains showed higher rates of respiration. Our ETRs (normalized to PSII reaction center content and expressed as electrons s-1 RC-1), generated from active fluorescent measurements are being recognized as superior, instantaneous and non-intrusive alternatives to the traditional methods of oxygen evolution or assimilation of CO2 especially in controlled experiments such as those undertaken here where the photo-physiology of phytoplankton subjected to different treatments is being examined (Silsbe et al., 2015; Schuback et al., 2016). Our current experiments suggest that NH4+ accumulation prevents endosymbiont nutrient limitation which we evidenced from the invariant parameters of the ETR-E curves for both fed and non-fed cells. This is indicated by higher accumulation of NH4+ in LL exposed vs. HL exposed cells suggesting higher uptake rates of NH4+ when light levels were more conducive for NH4+ uptake and phytoplankton growth (MacIsaac and Dugdale, 1972). Although it is likely that the endosymbionts benefited from the accumulation of NH4+ in Noctiluca cells we have to approach this conclusion with caution as we presently do not have the NH4+ concentrations in the treatment bottles which would have provided us with information as to whether ammonia could have been excreted into the media. Excretion of NH4+ by blooms of red Noctiluca has been documented (Okaichi and Nishio, 1976; Montani et al., 1998; Ara et al., 2013) which in times of bloom can enhance growth of other phytoplankton (Ara et al., 2013). We have however not observed enhanced nutrients from the large scale blooms of green Noctiluca that we have reported previously in the Arabian Sea (Gomes et al., 2008, 2009, 2014). The fact that our culture of Noctiluca can survive for several months without food nor replenishment of nutrients in the media suggests a tight recycling of nutrients which allow endosymbionts to grow as well as support the growth of the host Noctiluca (Furuya et al., 2006a). Using an algal culture with differing N and P elemental composition Zhang et al. (2017) showed that the heterotrophic red Noctiluca strictly regulates its stoichiometry which allows it to tide over when resources are scarce. Total cellular elemental ratios of this red Noctiluca strain were nearly homeostatic, although its intracellular pools of NH4+ and PO4+ were weakly regulated. Additionally, this strain of red Noctiluca, was found to regulate its internal N more strongly and efficiently than its P content making it more vulnerable to P limitation. If this is also the case with green Noctiluca, it can explain its predominance in the Arabian Sea (Gomes et al., 2008, 2009) which is severely N but not P limited (Morrison et al., 1999). Future studies such as that of Zhang et al. (2017) with green Noctiluca will better enable us to understand what has triggered the recent and pervasive annual blooms of Noctiluca in the Arabian Sea which portend to cause severe repercussion for the marine resources of great economic and cultural significance to the more than 86 million people living along the coast. In the Arabian Sea, Noctiluca does not appear to be a preferred food source for common mesozooplankton and instead appears to be consumed by jellyfish and salps potentially casing disruptions to the traditional diatom-sustained food chain (Gomes et al., 2014). More studies such as these are required to better understand the interplay between autotrophy and heterotrophy in the green Noctiluca so that mixotrophy can be included in conceptual and mathematical models. The current exclusion of mixotrophy misrepresents the functioning of the biological pump with important implications for our understanding of the influence of climate change on aquatic ecosystems (Mitra et al., 2014). The recently isolated mixotrophic strain of green Noctiluca which harbors large populations of the Chlorophyte P. noctilucae yielded some interesting results on its mode of nutrition that could complicate the description and modeling of food web structures in pelagic ecosystems. The green Noctiluca showed a definite preference for certain algal foods preferring the dinoflagellate P. foliaceum and the pennate diatom P. tricornutum to another diatom T. weissflogii and the chlorophyte Pyramimonas sp. However, regardless of the food provided, light was necessary for Noctiluca to grow and growth was severely diminished at low irradiances of around 10 μE m-2 s-1. This was confirmed by the instantaneous and non-intrusive measurements of variable fluorescence derived ETRs. However, when exposed to adequate light levels, however, ETR did not show any change in cells that were fed the preferred foods and those that were not indicating that the green endosymbionts were not nutritionally starved. The tight recycling of nutrients internally is indicated by the fact that our Noctiluca culture is able to sustain itself for several months without extraneous food or nutrients. Our first of their kind albeit preliminary measurements on the intracellular concentration of ammonia suggests that in the presence of adequate light, ammonia which accumulated early in the experiment decreased to undetectable levels soon after indicating uptake by the green endosymbionts. HG and JG conceived and planned the experiments. HG processed the data and wrote the paper. KM planned and conducted the experiments. AM and ST conducted the experiments. KA-H provided insights on Noctiluca’s physiology from field studies for growing it in culture. XJ processed the data. This work was supported in part by grants from Gordon Betty Moore Foundation, United States, the Sultan Qaboos Culture Center, United States and from NASA (NNX17AG66G-ECO4CAST) to JG and HG. AM acknowledges support from the NSF program “Research Experience for Undergraduates.” ST acknowledges the support of Peddie School, Hightstown, NJ, United States where she was a High School student when this work was undertaken. XJ was supported by the Chinese Scholarship Council. We thank Dr. Daniel Kaufman, Chesapeake Research Consortium, MD for providing the curve fitting MATLAB code. We are grateful to our colleague, Prof. O. Roger Anderson, Columbia University for his insights and support for this and related work. FIGURE S1 | Schematic of experimental set-up of Noctiluca cells fed with four types of algal food as well as unfed cells all exposed to optimal light (250 μE m-2 s-1, HL). A similar and parallel experiment was set up under low light (10 μE m-2 s-1, LL). TABLE S1 | Statistically significant levels for comparison of HL vs. LL (n = 25), fed and unfed Noctiluca cell counts (n = 7) and for the parameters of the ETR-E curves (n = 4). P values were obtained using a two-sample t-test. All statistically significant levels (p < 0.05) for p-values are denoted by ∗. Elbrachter, M., and Qi, Y.-Z. (1998). “Aspects of Noctiluca (Dinophyceae) population dynamics,” in Physiological Ecology of Harmful Algal Blooms, eds D. M. Andersen, A. Cembella and G. M. Hallegraeff. (Berlin: NATO ASI Series), 315–335. Falkowski, P., and Kolber, Z. (1995). Variations in chlorophyll fluorescence yields in phytoplankton in the world oceans. Funct. Plant Biol. 22, 341–355. Falkowski, P. G., and Owens, T. G. (1980). Light—shade adaptation. two strategies. Mar. Phytoplankton 66, 592–595. Furuya, K., Saito, H., Rujinard, S., Vijayan, A. K., Omura, T., Furio, E. E., et al. (2006a). Persistent whole-bay red tide of Noctiluca scintillans in Manila Bay, Philippines. Coast. Mar. Sci. 30, 74–79. Goes, J. I., and Gomes, H. D. R. (2016). “An ecosystem in transition: the emergence of mixotrophy in the Arabian Sea”, in Aquatic Microbial Ecology and Biogeochemistry: A Dual Perspective, eds P. Glibert and T. Kana (Newyork, NY: Springer International Publishing), 245. Gorbunov, M. Y., and Falkowski, P. G. (2004). “Fluorescence Induction and Relaxation (FIRe) technique and instrumentation for monitoring photosynthetic process and primary production in aquatic ecosystems,” in Photosynthesis: Fundamental Aspects to Global Perspectives, eds A. V. D. Est and D. Bruce (Lawrence, KS: Allen Press), 1029–1031. Montani, S., Pithakpol, S., and Tada, K. (1998). Nutrient regeneration in coastal seas by Noctiluca scintillans, a red tide-causing dinoflagellate. J. Mar. Biotechnol. 6, 224–228. Okaichi, T., and Nishio, S. (1976). Identification of ammonia as the toxic principle of red tide Noctiluca miliaris. Bull. Plankton Soc. Japan 23, 75–80. Platt, T., Gallegos, C. L., and Harrison, W. G. (1980). Photoinhibition of photosynthesis in natural assemblages of marine phytoplankton. J. Mar. Res. 38, 103–111. Poulton, N. J. (2016). “FlowCam: quantification and classification of phytoplankton by imaging flow cytometry,” in Imaging Flow Cytometry: Methods and Protocols, eds N. S. Barteneva and I. A. Vorobjev (New York, NY: Springer), 237–247. Sweeney, B. M. (1976). Pedinomonas noctilucae (Prasinophyceae) the flagellate symbiotic in Noctiluca (Dinophyceae) in Southeast Asia. J. Phycol. 12, 460–464. Copyright © 2018 Gomes, McKee, Mile, Thandapu, Al-Hashmi, Jiang and Goes. This is an open-access article distributed under the terms of the Creative Commons Attribution License (CC BY). The use, distribution or reproduction in other forums is permitted, provided the original author(s) and the copyright owner(s) are credited and that the original publication in this journal is cited, in accordance with accepted academic practice. No use, distribution or reproduction is permitted which does not comply with these terms.